KIEV, Ukraine -- World heavyweight boxing champion and MP tells reporters, ahead of fight in Mexico, he is keen to run for president in 2015. 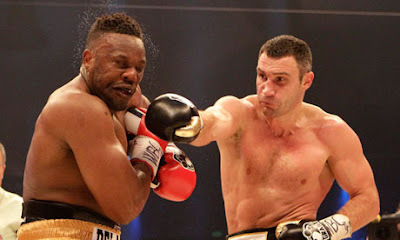 WBC heavyweight champion Vitali Klitschko, right, lands a punch on Britain's Dereck Chisora during a title bout in 2012. First he was a boxer, and a brainy one at that – the first heavyweight champion to hold a PhD. Then he was an MP, winning a seat in the Ukrainian parliament last year after promising to shake up the political establishment. Now Vitali Klitschko is reportedly keen to run for president in Ukraine, with a promise to modernise the country and improve the lives of ordinary Ukrainians. During a trip to Mexico to discuss his next fight, the reigning WBC heavyweight champion, said he would run for president in 2015, according to the World Boxing Council. His office would not confirm the report. But Klitschko, 42, has become one of Ukraine's most popular MPs with a reformist agenda and a stellar sporting career behind him. Klitschko was elected to parliament last autumn as part of the pro-western party Udar. Since then, he has campaigned against what he calls authoritarian moves by President Viktor Yanukovych, such as the jailing of former Ukrainian prime minister, Yulia Tymoshenko. His supporters are known in Ukraine as the "disappointed" – people who don't believe in the authorities or the opposition and feel bitterly let down by the failure of the 2004 Orange revolution. "Many people want to be the president, many people. But it's not enough. If some candidate doesn't have support of the people it's no more than a wish."